One of the frustrating things about tracking emigrating members is the increasing tendency towards mobility. In today's world we will drive or fly across the country for a wedding, or a funeral, or even a vacation. Some of us will do it without much thought, while for others it might be a considerable financial outlay. A hundred years ago the cost was much greater, when compared to average income, and so far fewer were able to take on such travel. But that doesn't mean it didn't happen. Of course LDS missionaries traveled back and forth across the United States frequently. Though LDS members did so far less frequently, they still made the trip when the occasion called for it. Of course the question comes up about whether a trip from Tennessee to Utah is considered temporary or a genuine change of residence. In some cases the answer isn't so obvious. 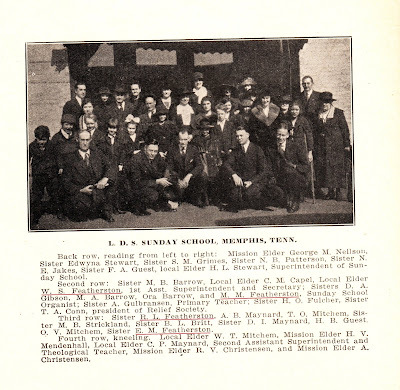 The family of William S & Rosa Lee Featherston (sometimes spelled Featherstone, and no, there is no relation to the GA with the same last name) were stalwart members of the Memphis Tennessee branch. They filled positions in the presidency of the branch and its auxiliaries, ever since their baptism in 1907 & 1906, respectively. In 1918 the family felt the pull to head west to join the other saints in Utah. According to mission reports they left sometime between 21 March 1918 and 12 September 1918. Of course they had to have left on a specific day, but records don't always agree, so I'm left with a range. Of course, they may have left on different days, perhaps intentionally in stages. And here is where their movement gets fuzzy. In one record a family member registers for the draft using the family's Memphis address as his permanent home address, while at the same time indicating he is working as a farm laborer in Cache County, Utah. Then just 3 weeks later he is back in Memphis, as the primary informant on the death certificate for his brother, using the same permanent address. It brings up so many questions that have no obvious answers. Did they consider themselves only temporarily working in Utah and not really emigrants? Did the family return to Memphis just before this one son died from influenza? Or did they return because of it? Did the father stay in Utah? or were the family seperated, with only the working age men spending the summer in Utah with the rest of the family staying in Memphis? 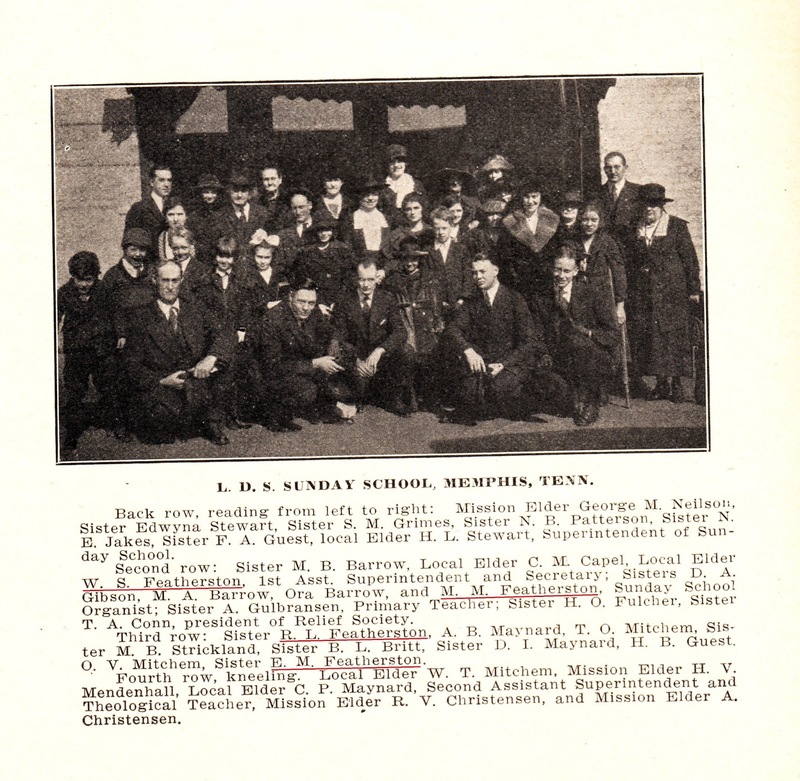 Ultimately the whole family was back in Memphis in 1923 when they stood for a photograph of the Memphis Branch Sunday School. At least four of the family are in this photo. I have tried to pick out the faces in the crowd, but the missing names of the several children in the photo has made that difficult. Plus the lack of clears rows. I'll let y'all do that. One of the children was likely Herbert, even though he is not named. After this photo they again appear to have headed west, this time for Salt Lake City (Sugar House) in November 1923. This time the family stayed in Utah, where each and every family member, except Harry, were eventually buried. Note 1: Rosa Lee or Rosalie. Long time readers will find it interesting that Rosalie Britton was born in Shady Grove, Tennessee, a long standing enclave of Mormons at the time. Her father, Edward T Britton, joined the Church nearly a year before Rosalie. Although there does not appear to be any familial connection with other known members of the Church in Shady Grove, the possibility of the family having a friendship connection with one of the many LDS families in Shady Grove must be considered. Note 2: Minnie married Johnie Means, the son of converts from Tennessee who had emigrated to Kelsy Texas. The Means family is deserving of their own post in the not too distant future. I personally get excited when Tennessee family history starts to mix like this. It is like bringing two stories together.